Renowned for its fierce and modern jewelry, highlighted with signature "MEGHNA JEWELS" pave diamond arches in these double drop Claw earrings. 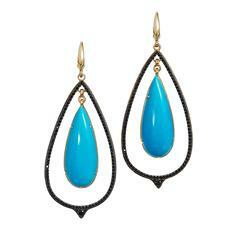 These gorgeous drop earrings are handcrafted in 18K gold, sterling silver, .71 ct diamonds and 7.54 ct turquoise. A fabulous way to add some subtle glamour and edge to your everyday or evening look. 18K Gold 1.46 grams, Sterling Silver 4.17 grams, Turquoise 7.54 ct, Diamonds .71 ct *Each of the pieces can be customized in your favorite metal or gemstone. Please contact us for more information on this piece or creating your own Meghna Jewels bespoke piece. Ear clips or fish hook closure can be customized. Please allow 2 to 4 weeks of delivery time as each piece is handcrafted. 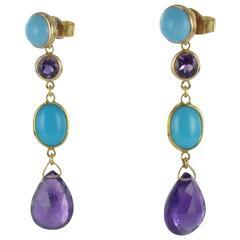 Double drop chalcedony stones faceted on both sides bordered in 18K gold and gold chain. Pave` set diamonds in oxidized sterling at the top. Gold French wire for pierced ears. 14 karat yellow gold double drop hoop earrings featuring two 35.1 millimeter x 12.9 millimeter pear-shaped turquoise at center with black spinel pave accent embellishment. 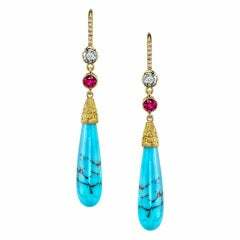 Turquoise drops capped with solid 18K etched gold and perfectly cut ruby and diamond studs.